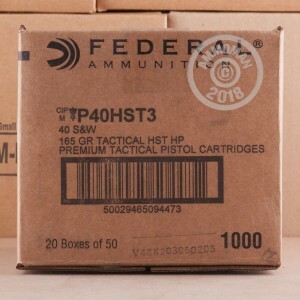 Federal HST hollow points are an excellent defensive load designed for high weight retention and penetration. Each .40 S&W cartridge in this case of 1,000 fires a light 165 grain jacketed hollow point bullet at an above average muzzle velocity of 1,130 feet per second, producing excellent terminal ballistics in a self-defense situation. 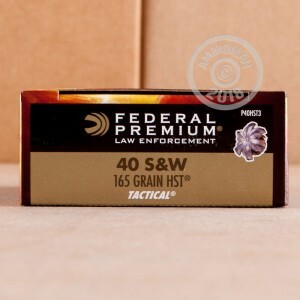 Originally designed for law enforcement use, HST bullets were made available to the general public in 2013. They are distinguished by their "skived" tip, which expands into six petals with lead and copper layers and sharp edges designed to enhance penetration and expand to 1.75 to 2 times the diameter of the unfired bullet. 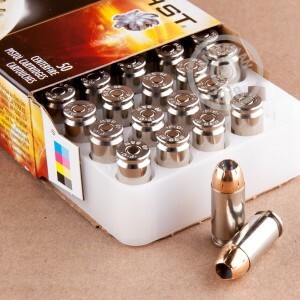 These cartridges use non-corrosive Boxer primers and nickel-plated brass cases. All orders over $99 (including 1,000 round cases like this one) ship for free at AmmoMan.com--place your order today!